Beautiful modern condo, brand new to the rental program in July 2015! Perfect spot for a couple or small family with discriminating taste! Completely gutted and remodeled in 2012! Gourmet kitchen includes, custom cabinets, quartz countertops, stainless appliances, beautiful tile backsplash, under cabinet and LED ceiling lights, stack washer/dryer (HE detergent only), brand new tile shower, bamboo flooring throughout and ceiling fans. Additional amenities include large LED HD Smart TV, (Netflix access with your credentials), DVD player in living room, LED HD TV in Master bedroom, wireless Internet access and keyless entry. 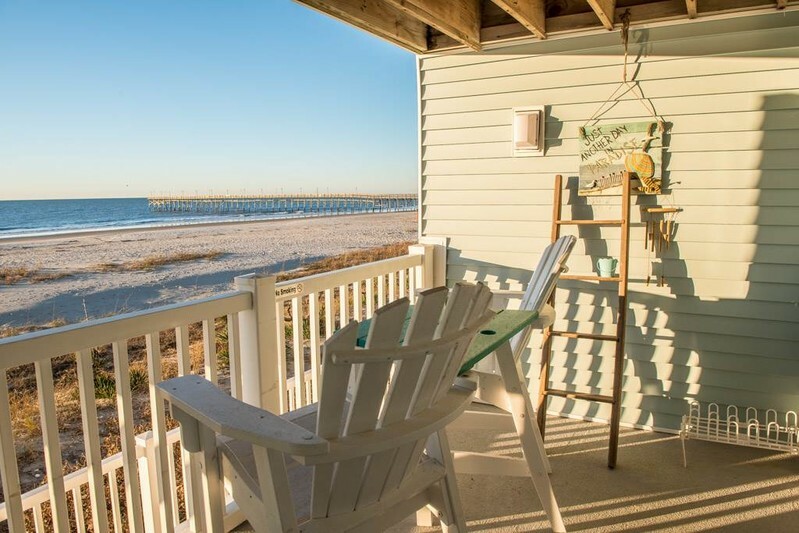 This is an oceanfront condo with a covered, private pocket porch and amazing views of the Atlantic Ocean and the OIB pier. Access to the oceanfront community swimming pool and hot tub, community grilling and outdoor shower. Great location, close to shopping, restaurants, and the pier. On the quiet end of the complex, not in front of the pool. Non-smoking and no pets. Sleeps up to 4. King bed and queen sleeper sofa in the living room. All bed and bath linens are provided with the rental. We enjoyed our visit to Ocean Isle. The location of the condo, right on the beach , was perfect. The property was sparklingly clean. The kitchen was updated and had everything we needed. We had been doing some traveling and enjoyed the washer/dryer. It was ideal for our visit. We came to ocean isle for the first time for our baby moon. We were so happy that the condo looked exactly like the pictures. It was very clean and one of the nicest condos we've stayed at. The decor and updates were perfect. The only criticism I can say is that the bed was very soft which made it very hard to get out of. Also the code to the door didn't work upon our arrival and again the next day. We were helped quickly though. We are considering staying again!